I don't need to tell you that now is a great time to travel. You can upgrade last year's vacation (ie, stay in suites instead of rooms) for the same price (or maybe less) OR take advantage of the incredible opportunities at luxury hotels worldwide. Personally, I'm more a fan of those hotels that do more than just drop their price when occupancies are low. True luxury these days, is all about value and the experience you get for your $$. That said, here are just a few of my favorite luxury hotel deals currently on offer (MORE to come later this week!). 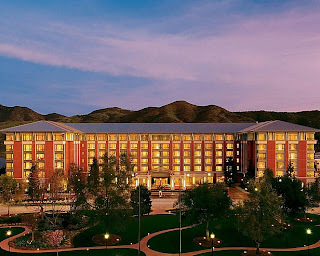 The Four Seasons Westlake Village earns kudos for its creative, 2-night "Double the Fun" deal. Basically, two people enjoy a 2 night stay for the price of one, PLUS the second person doesn't pay for spa or f&b charges (equal to those of first person and exclusive of alcohol/gratuities. Best deal is on the weekends, nightly rates through Sept start at $375. As a Preferred Partner, we'll also get you breakfast for 2 and an upgraded room (if available at check in!). I'm also giving props to the Bermuda tourism department, not for its 2-day, 50 percent off at certain hotels sale, but for its summer long "$400 resort credit" promo. To celebrate the island nation's birthday, stay at hotels like Cambridge Beaches or the Fairmont Southampton Princess and enjoy $400 to spend on food/beverages, spa treatments, etc. Our clients get an extra $100 at Cambridge Beaches, plus daily breakfast & an upgrade! I LOVE what Orient-Express is now offering at its fabulous Italian properties, including FREE wine-tastings at Hotel Cipriani in Venice, FREE Ligurian cooking lessons at Hotel Splendido in Portofino, FREE personal training sessions at Villa San Michele in Florence & FREE cruises along the Amalfi Coast in the Hotel Caruso's Ercole boat. As a Bellini Club affiliated partner, our clients enjoy complimentary upgrades upon availability & other special perks as well! St. Regis is also on my radar with its $375 (breakfast inclusive) intro rates at St. Regis Princeville opening October 1. Book now & chances are pretty good an upgrade is guaranteed. Families can enjoy half-off a connecting room for kids this summer at St. Regis Punta Mita when a suite is booked. St. Regis Punta Mita also has a great Golf package with rates from $645 that include greens fees for two and a room upgrade. Last but not least, for now, two of my new favorite hotels, CordeValle & SandHill Resort (Rosewood Hotel's gems in Northern California) have fantastic summer offerings. Ask us about "free golf" at CordeValle (where our rates also include breakfast) and incredible spa packages at SandHill (the perfect spot for a meeting in Menlo Park, by the way). I PROMISE! More luxury deals to be posted later this week. For more info on any of the above, to book or learn about the special perks offered exclusively to clients of Elite Travel International, call 310 979 9036, email elitetravelgal@gmail.com or visit www.elitetravelinternational.com.